We were really excited to receive a revolutionary new concept in children's activities to review this week. The Weekend Box Club was developed by what may be the most awesome Uncle ever. Unable to find gifts for his niece and nephew that were fun and educational, creative, non-gimmicky and not plastic trash, he quit his job and developed this brilliant club. Every fortnight you get a box containing everything you need for something to cook, something to explore, something to make and something green. I found it incredibly helpful that even though it contains loads of things, the box is designed to fit through a standard letterbox so we didn't have the hassle of having to trek across town to the mail collection office if we weren't in when it was delivered. I had intended to review the whole box today, but we found there was so much to do I am going to break it down into two activities per post. Since it is St Patrick's Day today, I'm going to cover the Pot 'o gold game and the green pancake kit. Ollie woke up with a fever on Friday morning, so having a mysterious paper envelope to open which turned out to contain plastic gold coins and pipe cleaners in rainbow colours really cheered him up. Each activity comes with a double-sided card with clear instructions and background information, plus a sticker to attach to the card when you've completed it. For the Pot o' gold game all we needed to add to the materials sent was a cup to construct our rainbow in. I really like this kind of activity because it is deceptively simple but has a range of learning outcomes, some of which are mentioned on the instructions card. We used it to revisit the colours of the rainbow, which Ollie knows because I've always sung the rainbow song using the real colour spectrum instead of the traditional words. Ollie never heard of Leprechauns though so this was a great opportunity to introduce that mythology to him. The time suggested on the card was 25 minutes, but we probably spent a lot longer with it on and off because both boys had such fun throwing coins into the mug, tipping them out and remaking the rainbow. Toby particularly laughed his head off throwing the coins. We had a delay for a while when he got possessive of the coins and took some persuasion to share them. The game comes with six coins, so we had a great opportunity to use some basic maths skills as Ollie shared out coins between himself and his brother, or all three of us. 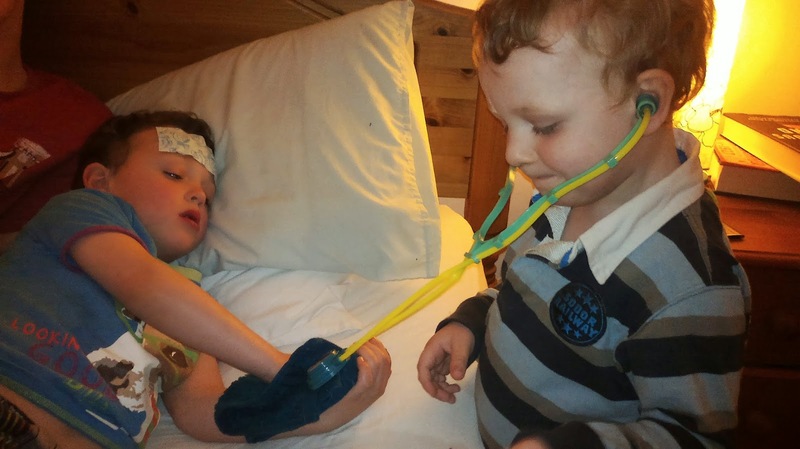 All this fun wore out poorly Ollie, so we had a gap before trying out the next activity while Toby looked after him. The following evening Ollie was well enough to get out of bed and do the next activity from our box - making green pancakes. I had been itching to try this one as the spices supplied in the box were making the whole kitchen smell delicious. For this activity we again had a clear instruction card. 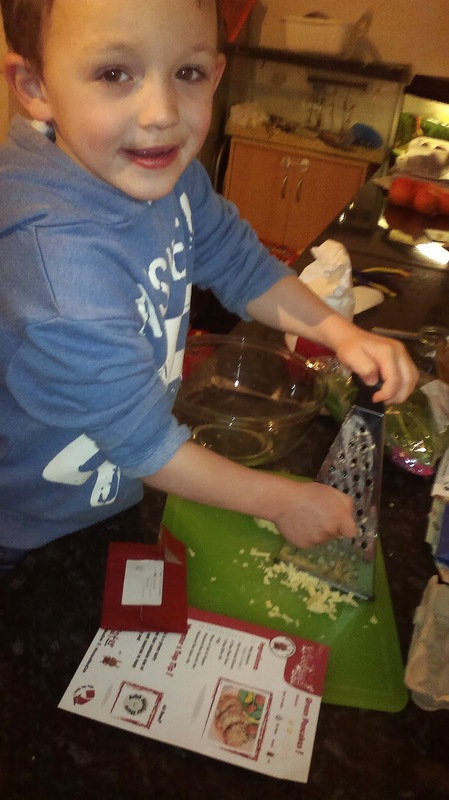 Apart from some help in reading the instruction and an adult to cook the pancakes on the hob, the activity was something Ollie could manage by himself so he got a real sense of achievement that he had cooked our whole dinner. Our result didn't look like the ones on the picture supplied, but we're used to that with our cooking. Ollie really enjoyed weighing out the ingredients using the scales because he can now read the weight he needs to measure from the instructions and look at the display on the scales to match the numbers. He also grated up all the cheese without grating his fingers, broke the egg without getting any shell in the mix and added the flour without it going everywhere. He got a bit distracted adding the paprika and trying to watch Matt and Toby making a cake, but most of it ended up in the bowl. 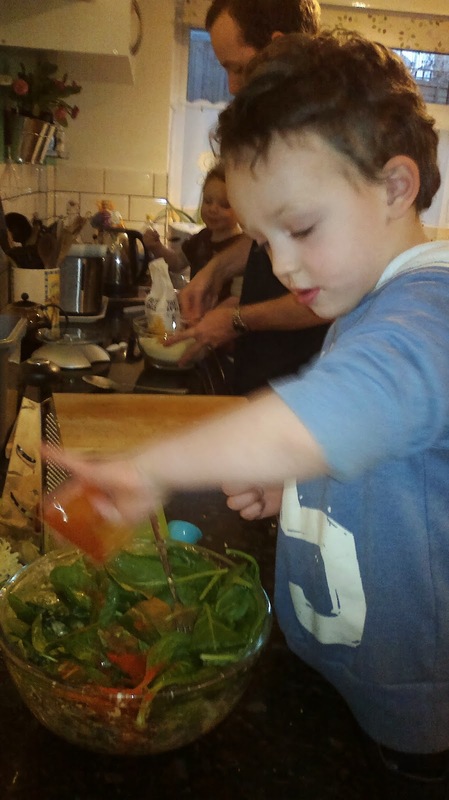 Activities like this are fantastic for building children's self esteem and also getting them to try new ingredients if they're going through a fussy stage. 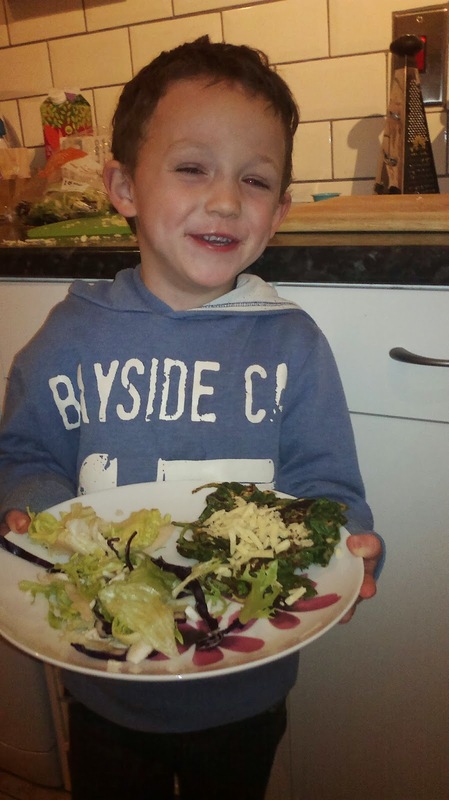 It's not foolproof, but kids will tend to eat anything they've cooked themselves. We have two further activities to describe in the next post, which have been great fun, including making a robot voice box and a rocking bird. 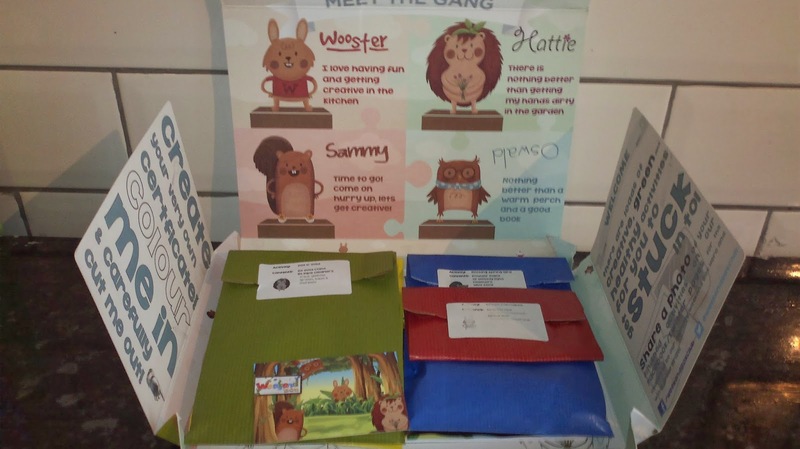 The boxes cost £7.50 each, which I think represents really good value both for the items sent (which have even included the glue stick we needed for the rocking bird) and for the thought that has gone in to each activity. Some items such as the spices have obviously been used up, but others such as the coins and pipe cleaners will be used over and over. The boxes are delivered fortnightly which also makes them more affordable, and with four activities in each box there is enough to do to last two weekends. 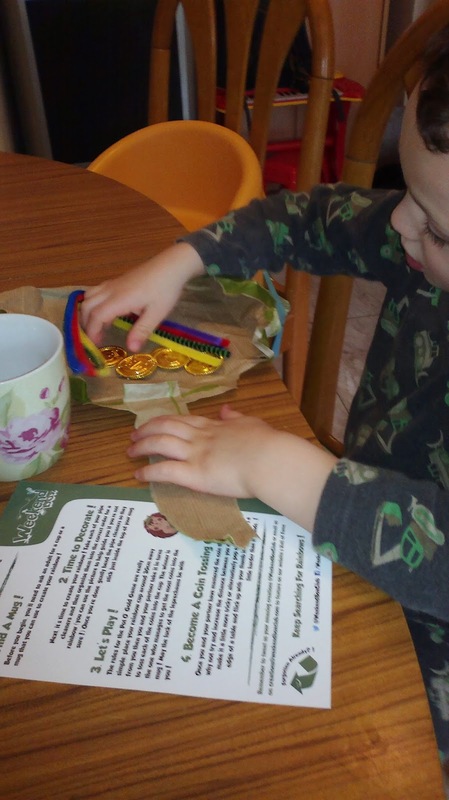 The boxes are designed for three to eight year olds, but with caution and close supervision when using the small objects such as the coins we have found that Toby has had lots of opportunities to get involved too. I would recommend opening the box and having a look through before you intend to let the kids loose on it if your children are at the impatient younger end of the scale so you can get in any bits and pieces you need that couldn't be supplied for practical reasons, such as the spinach and egg for our pancake recipe. The eco-credential are really good - 100% of the contents are re-usable or recyclable, and 95% comes from recycled materials. NB we received the box for free to review, but all opinions and photos of cheeky children are my own.